Wyoming is the latest state to commit to using personalized, research-based digital learning strategies in its schools to prepare students for college and careers. The Wyoming Department of Education announced last week that it is joining Future Ready Schools (FRS), a national movement, by launching a statewide initiative of the same name. Joining FRS provides Wyoming’s school districts with practical resources that help teachers and students use technology to personalize students’ educational experiences. For example, joining provides access to the Future Ready Hub, a one-stop-shop for research-based digital learning and planning materials. District leadership teams can also attend one of the many summits, workshops, webinars, chats, as well as gain access to a number of state leadership programs scheduled year round. In addition, joining enables access to the FRS Interactive Planning Dashboard that consists of a 5-step collaborative planning process. Currently, nine out of 48 of Wyoming’s districts have signed on to the initiative. Enrollment is not mandatory, but districts will need to sign up to use the FRS resources. The United States Department of Education and the Alliance for Excellent Education first launched FRS in 2014 with the goal of maximizing digital learning opportunities and helping school districts prepare students for college and beyond. Furthermore, FRS builds on the momentum of President Obama’s ConnectED initiative to bring high-speed internet access to districts, with an end goal of reaching 99 percent of schools within five years. Since its launch, more than 2,300 districts have signed the Future Ready District Pledge. Wyoming is one of 17 states that have committed to the FRS, joining California, Indiana, Kansas, Kentucky, Maine, Maryland and others. 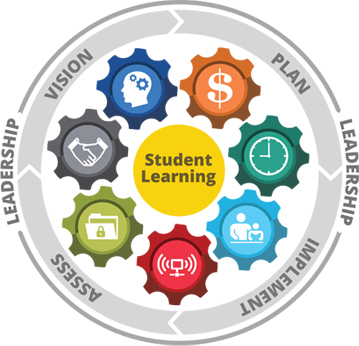 The Wyoming Department of Education released the first draft of its Digital Learning Plan 2017-2021, and plans to release the final version on Oct. 1. Further information is available on the Wyoming Department of Education site.